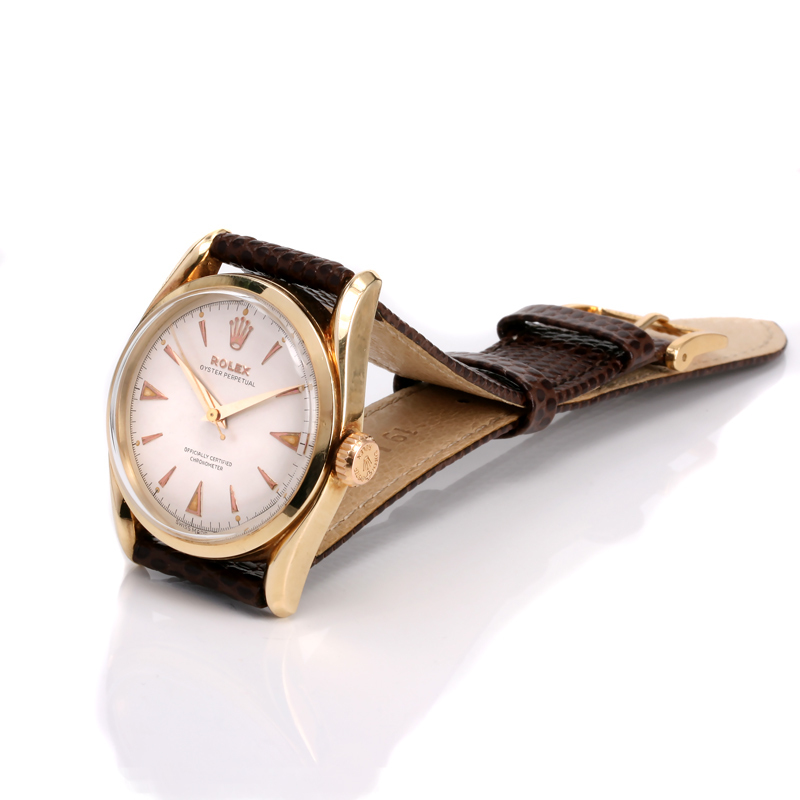 Product code: W652 Categories: Sold Items, Sold Rolex Watches. Here we are proud to offer a very rare vintage Rolex Oyster Perpetual model 6090 with bombe lugs that has just come back from a full service and overhaul and is in brilliant condition including its original dial. The bombe lugs refer to the inward sculptured lugs and are also erroneously known as “Bombay” lugs, however no matter which way you spell it, there is no denying that this is one incredibly elegant example of a vintage Rolex Oyster watch. Fitted in a solid 14ct yellow gold case that measures 34mm across plus the Rolex Super Oyster crown. The Rolex Super Oyster crown was produced by Rolex for a few short years and was designed to self seal for those who forgot to screw the crown in. The dial as mentioned is all original and has not been repainted and looks incredible with the triangular and index markers and finished the centre sweep seconds hand. 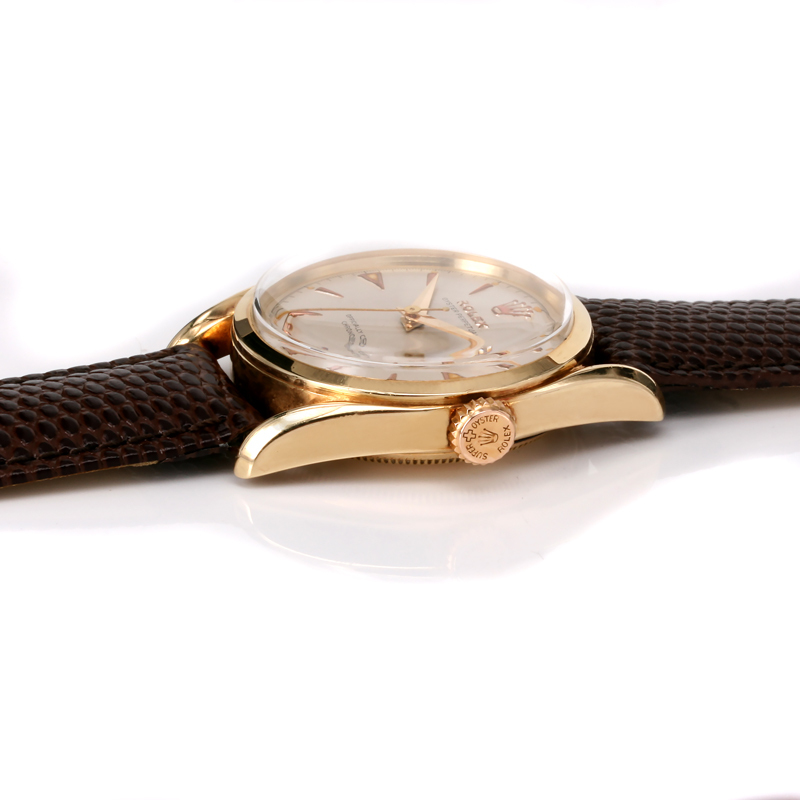 Inside the movement and crown has undergone a full service and runs perfectly and comes with our twelve month warranty. With those gorgeous inward turning sculptured Bombe lugs, this vintage Rolex Oyster Perpetual watch is a classic that will only look better year after year.